The world’s most popular museum, the superb Musée du Louvre participates in the Night of Museums event! You’ll have until midnight to discover the collections of this irreplaceable institution of the Parisian cultural landscape. Egyptian or Renaissance, Romantic or Impressionist periods, the East or in the West; whatever your interests you’ll be amazed by the wonder-filled galleries of the Louvre Museum. The museum dedicated to the arts of Africa, Asia, Oceania and the Americas awaits you on May 19th, offering for your pleasure thematic guided tours as fun as they are enriching. On the programme is an exhibition dedicated to the ghosts and hells of Asian art, evoking the spirits and fantastic creatures that have long been depicted in this region of the world - chills guaranteed! Music lovers will be delighted by the musical hiatus in the heart of the African collections. An excursion to the Musée du Quai Branly on May 19th will surely delight the whole family, young and old alike. Get a fresh perspective on the works of Monet at the Musée d'Orsay during the Night of Museums! This year’s event is entirely dedicated to that painter of genius. From Luncheon on the Grass to the Water Lilies cycle, explore Monet's dreamlike, poetic and delicate universe through guided tours and thematic pathways. In parallel, the Museum offers live jazz, a musical form that the artist particularly liked. Come and swing at the Musée d'Orsay, on the banks of the Seine, from 18:00 to midnight. Situated close to the Avenue des Champs-Elysées, the Grand Palais will also open until midnight on the occasion of the Night of Museums. Here you can discover the exhibition called Artists and Robots, featuring works of art created by increasingly sophisticated robots. Beneath the great glass dome of the Grand Palais, you’ll explore immersive installations, music generated by strange machines, and astonishing sculptures. Lovers of painting may prefer the exhibition dedicated to the Czech artist Kupka, a pioneer of the abstract art movement. After an exceptional evening devoted to visiting the most beautiful museums in Paris, you will be delighted to return to your elegant and cosy room at the Grand Hotel Saint Michel. Located on the Left Bank, in the Latin Quarter, our hotel offers high-end services and chic and contemporary surroundings. 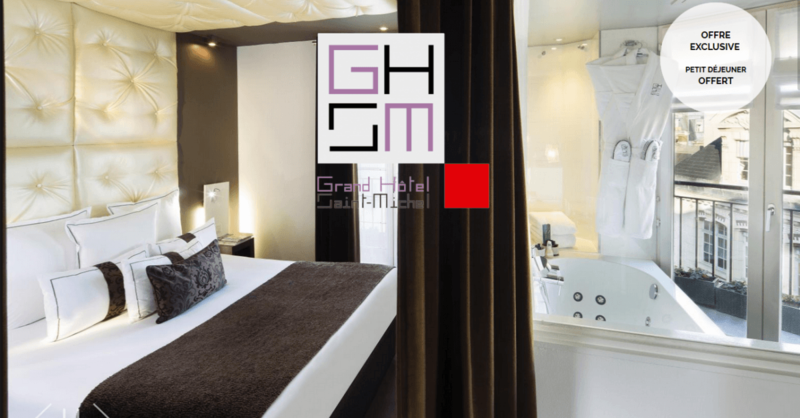 The rooms of the Grand Hotel Saint Michel are distinguished by their modernist decoration, comprised of discreet mirrors, designer furniture and subtle lighting, ideally combined with a high degree of comfort. In addition, our hotel offers a range of services that will delight you, such as baby-sitting undertaken by a licensed organisation, drivers to take you to and from the airport, and a concierge to reserve seats and tickets for your favourite events and shows.